Forensic investigators concerned after incendiary material found near Even Sapir - which was decimated by a Jerusalem area fire Sunday. Sunday's massive brushfire in the Jerusalem hills burned over 1,500 dunams (370.7 acres) of land, firefighters revealed in its wake - and may have been deliberate. Forensic investigators examining the damage Monday found two canisters of flammable material in the debris, Walla! News reports, further strengthening suspicions that the fire may have been arson. 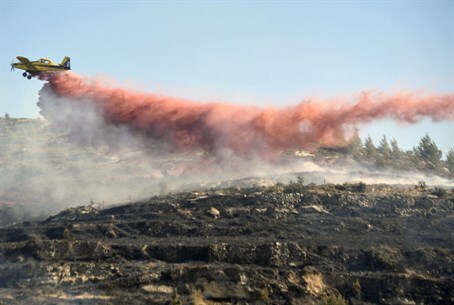 On Sunday, fire officials told both Channel 10 and Arutz Sheva that the fire - which decimated several homes in the Even Sapir moshav - was suspicious. In addition, a Knesset channel correspondent tweeted just as the blaze began that another fire had been extinguished in the same region the night before and that the two incidents could be related. Fifty firefighting teams and 150 career and volunteer firefighters worked to contain the fire at its height Sunday night. Three firefighters were injured. Fires are common in Israel during the summer, as the dry and arid desert heat can easily fan the flames of dying campfires. However, terrorists have also used the weather as an excuse to commit arson across multiple points in Israel, and a wave of large forest fires last year was attributed, at least in part, to deliberate attempts to overwhelm firefighting forces and destroy property.